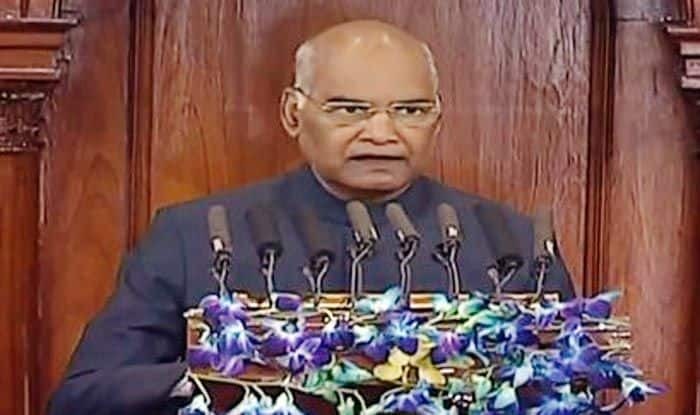 Let us all come together to pave the way for a New India and take India to glorious new heights in the 21st Century, said President Ram Nath Kovind. The targets of my Government were determined by countless and helpless faces such as – that poor mother who cooked in a smoke filled kitchen; that helpless sister who was compelled to postpone her own treatment due to financial worries despite serious illness; that daughter who had to wait the whole day until the cover of darkness for going to the toilet; that child who was compelled to wait for day light to study because there was no electricity; that farmer who was caught in the anxiety of repaying his loan while watching his crops damaged by hail storm; that youth who was unable to earn his livelihood because no bank would lend to him. These very thoughts have shaped the schemes of my Government. These ideals of Deen Dayal Upadhyaya’s Antyodaya have been the touchstone of my Government’s work. Work is being carried out with a new approach for reducing the cost of farming, providing the farmers with fair price for their crops, providing access to new markets and helping them with additional sources of income. My Government has taken the historic decision of fixing the Minimum Support Price – MSP of 22 crops at one and a half times higher than the production cost of the crop. Our mothers and sisters always used to save some money for difficult times. But often these savings were spent on daily needs. Today, Rs 88 thousand crore deposited in Jan Dhan accounts is a testimony to the changing saving habits. It is only because of the Jan Dhan scheme that wages from MGNREGA, benefits from different insurance schemes, scholarships, pensions and most other Government benefits are being credited directly into the bank accounts of the poor through DBT. Jan Dhan accounts have succeeded in eliminating the middlemen between the Government and the poor. Jan Dhan Yojana is playing an important role in facilitating cost effective digital transactions in the country through more than 60 crore Rupay debit cards and BHIM App. Similarly Government is bringing banking services closer to the people through the ‘India Post Payments Bank’ set up in the post offices. As a result, the whole world has taken note of this step towards financial inclusion in India. Whereas many social welfare programmes were in existence for the past several decades, they had failed to produce the desired impact. The alertness, action-oriented approach and good intention displayed by my Government towards the aspirations and difficulties of citizens have made it possible to bring about large scale visible changes. While giving a clear majority to my Government in 2014, the people of the country had also given a clear mandate to take strict action against corruption and black money. My Government has come down heavily on corruption in the past four-and-a-half years. Being sensitive to public sentiment, my Government has waged a war on corruption and black money from day one, and approved constitution of a Special Investigation Team- SIT on black money in the very first meeting of the Cabinet. Thereafter, Government enacted a new and strict law on black money. My Government also carried out a campaign against illegally acquired assets in foreign countries. New agreements were signed with several countries known as tax havens, and several others were signed with many other countries to rectify deficiencies in existing agreements. This action of the Government broke the back of the forces destabilising the country; and the systems sustaining the flow of black money. The registration of 3 lakh 38 thousand dubious shell companies responsible for flow of black money have been annulled by the Government. The directors of these companies have also been prohibited from holding such offices again. I am pleased that on account of these policies of my Government, people’s trust in the Government has increased, and there has been a sharp increase in the number of persons paying income tax. Whereas prior to 2014, 3.8 crore people had filed their return, this number has increased and more than 6.8 crore people have come forward to file their returns. Today, the tax payer is confident that each paisa contributed by him or her is being spent honestly on nation building. My Government believes that corruption and black money constitute a grave injustice towards the honest taxpayer of the country. Corruption always infringes on the rights of some poor or middle class person. The Government is relying on application of modern technology to address this situation. While Sardar Patel with his extraordinary abilities had accomplished the challenging objective of geographic and political integration of the nation, the task of economic integration remained incomplete. Our traders and entrepreneurs always faced difficulties in sale and purchase of their goods and in complying with different tax regimes prevalent in different States. Now with the implementation of a comprehensive tax reform like the GST, the concept of ‘One Nation-One Tax-One Market’ has been realised. GST is proving instrumental in establishing an honest and transparent system of trade and commerce which is also benefitting the country’s youth. This system, while reducing the difficulties faced by traders, has enhanced their ease of doing business across the country. I congratulate my compatriots for wholeheartedly embracing the new system in a short span of time in the interest of a better future for the country, in spite of the initial bottlenecks. My Government is continuously improving the GST regime keeping in view the suggestions being received from the business community. The primary focus of my Government has been to enable our youth to earn their livelihood with dignity, while also creating employment opportunities for others. In order to facilitate self-employment, my Government has introduced wide ranging reforms, which are being appreciated globally. As a result of these reforms, India’s position has improved by 65 places in the Ease of Doing Business ranking, from 142 in 2014 to 77 now. This is an extraordinary achievement. During the last four and a half years, the economy of the country has been growing at a rate of 7.3 percent on an average. India is playing a significant role in international trade. While India’s contribution to the world GDP was 2.6 percent in 2014, it has increased to 3.3 percent in 2017 as per the latest reports. India has emerged as the 6th largest economy in the world. This is an opportune moment for the country to play a decisive role in the 4th industrial revolution and my Government is committed to ensure that our citizens take full benefit of this opportunity. As a result of the ‘Make in India’ initiative effective outcomes in the field of industrial development and employment generation are clearly visible. Now India is the 2nd largest manufacturer of mobile phones in the world. Recently, the milestone of converting diesel locomotives into 10 thousand horsepower electric engines has also been established by India. As a part of Make in India initiative, Asia’s largest MedTech Zone is being established in Andhra Pradesh. Defence Corridors are being established in Uttar Pradesh and Tamil Nadu, which will not only strengthen our security through establishment of production facilities for defence equipment, but also provide employment to the youth. Soon, the passengers will also be able to avail the ultra-modern facilities of our fastest train till date – ‘Vande Bharat Express’. I also want to congratulate the scientists and engineers of our country who are tirelessly working for recognition of India’s prowess in this era of modern technology. The scientists and engineers from ISRO in particular are proving their pre-eminent position in the world by setting new records in launching satellites. I, on behalf of the nation, convey our best wishes to our scientists and engineers for ‘Mission Gaganyaan’. The focus of my Government on timely completion of tasks, with accountability, has resulted in increasing the confidence of the people in Government functioning and has also enhanced the pace of development. My Government has established a reputation for time bound completion of projects. Many projects where delays in completion had become synonymous with injustice to common people of this country such as India’s longest Bogibeel railroad bridge in Assam, Western Peripheral Expressway near Delhi, Kollam Bypass in Kerala have been fast tracked and completed. By completing these projects, my Government has done justice to the resources of the nation and aspirations of the people. Developing modern infrastructure for economic development as per the needs of 21st century, is the aspiration of every Indian, especially the middle class. Sensitive to their aspirations, my Government is completing new projects at a fast pace. The airport terminal constructed at Prayagraj in a record period of 11 months is an evident example. Last year, the country’s first container vessel sailed along the national waterway from Kolkata and reached Varanasi. Eastern Peripheral Expressway, started in November 2015, has also been dedicated to the nation last year. My Government believes that eastern part of India comprising east Uttar Pradesh, Bihar, West Bengal, Odisha and the States of North- East, has the potential to become a new ‘Growth Engine’. Therefore, my Government is relentlessly striving to strengthen the infrastructure related to railways, highways, waterways and airways in Eastern India. Under the Udan Yojana, 19 new airports are being built in Eastern India and of these 5 are coming up in the North East. The construction of Pakyong airport in Sikkim and Veer Surendra Sai Airport at Jharsuguda in Odisha has been completed. The work of reconstruction of fertilizers plants at Gorakhpur in Uttar Pradesh, Barauni in Bihar and Sindri in Jharkhand, which were closed for several years, is progressing rapidly. The ‘Urja Ganga Pariyojana’ started with an approximate outlay of Rs.13 thousand crores will help expand the industries based on gas pipeline in several cities of Eastern India. My Government is setting up new AIIMS and new Indian Agriculture Research Institutes in Eastern India. The Government has also established a Central University at East Champaran-Motihari, the ‘Karma-bhumi’ of Mahatma Gandhi. Similarly, the work on the ‘Gas Cracker Project’ which is important for Assam and Paradip Oil Refinery in Odisha has also been expedited. The Dhola Sadiya Bridge named after Bhupen Hazarika, linking Assam and Arunachal Pradesh has already been dedicated to the nation. Out of the 18 thousand villages electrified by the Government, about 13 thousand villages are in Eastern India and out of these 5 thousand villages are in the remote areas of the North-East. My Government is working towards bringing about a transformation through transport and tourism in order to make the lives of the people of North-East easier. Almost all the railway lines of the North-East have been converted to broadgauge. Efforts are underway to provide rail connectivity to the capital cities of all the 8 States. For this, the work on 15 new rail lines is under progress at a cost of approximately Rs.50 thousand crores. Be it the country’s fastest train, the highest bridge, the longest sea-link, the longest tunnel, construction of highways at double the speed or gauge conversion of railway tracks, modern facelift of railway stations or metro projects in cities, air connectivity among small towns or construction of a new waterway, my Government is rapidly developing modern infrastructure in all these areas. Keeping environment conservation in mind, my Government is moving forward on the electric mobility front. In addition, in the last four and a half years Government has established more than 300 new Passport Sewa Kendras in the country. Prior to 2014, there were 77 Passport Sewa Kendras, which have now increased to more than 400. People are no longer required to repeatedly visit big cities for getting their passports. In the all-round development of the country, a pivotal role is played by our labourer brothers and sisters, small and medium entrepreneurs, engineers, auditors, doctors, teachers, scientists and every professional. All these responsible citizens have lived up to this saying of Sant Ravidas that work is the best form of worship. Our hardworking professionals whether linked directly or indirectly with the Government, are watchful of the process of nation building. When their hopes and aspirations are combined with the willpower of Government employees, the result is unprecedented, as witnessed by the nation today. My Government is also supporting the employees in their hour of need. By implementing the recommendations of the 7th Pay Commission, my Government has strived to improve their living standards. My Government has worked continuously to strengthen the spirit of Cooperative Federalism enshrined in the Constitution. It has been the endeavour of the Government to enable the State Governments to undertake development work in their respective States in a more effective manner. In line with this objective, my Government took the decision to provide the States with 10 percent additional share in taxes as per the recommendations of the Finance Commission. At this time, the whole world is talking about Kumbh, underway at Prayagraj. For this colossal event, world-class infrastructure and other facilities on a permanent basis have been developed at a fast pace. The confluence of Ganga-Yamuna-Saraswati is setting an impressive example of cleanliness and modern management. Every citizen and the Government are duty bound to honour the contribution of National heroes. Carrying forward the tradition of honouring the builders of modern India, my Government has dedicated to the nation the ‘National Salt Satyagraha Memorial’ at Dandi on the death anniversary of Mahatma Gandhi. Kranti Mandir, a museum in Delhi dedicated to Netaji Subhash Chandra Bose has been opened to public this month. The Government has also instituted Netaji Subhash Chandra Bose Disaster Management Award in his honour. The Government has developed 5 sacred places associated with Baba Saheb Ambedkar as “Panchteerth”. The nation has paid tribute to the Iron Man of India Sardar Patel, by building the ‘Statue of Unity’, which is the tallest statue in the world. My Government is setting up museums in various States in the memory of the country’s tribal freedom fighters. My Government has conferred the Bharat Ratna on Mahamana Madan Mohan Malaviya and Atal Bihari Vajpayee in 2015. This year it has been decided to confer Bharat Ratna on Nanaji Deshmukh, Bhupen Hazarika and Pranab Mukherjee. By conferring national awards on the basis of merit and without any discrimination to those citizens, who have worked selflessly for the welfare of the people, my Government has demonstrated country’s commitment towards the ideals of sacrifice and service. In our tradition, the Saints and Gurus occupy the highest position. This month, to commemorate the Prakash Parv of Guru Govind Singhji, the Government has released a special coin. It is a matter of immense pleasure for all of us that my Government has taken the historic decision to construct the Kartarpur corridor. In the International context, while India is a staunch supporter of friendly ties with all countries, there is also a need to constantly strengthen our capabilities to tackle any challenges. Through the surgical strike on cross border terror posts, India has shown its new policy and strategy. Last year India joined the handful of countries that possess the Nuclear Triad capability. Our defence forces and their morale symbolise the prowess of the India of the 21st century. Not only has my Government fulfilled the demand for One Rank One Pension that had been pending for 4 decades, but it has also disbursed arrears amounting to more than Rs 10,700 crore to 20 lakh ex-servicemen. My Government believes that neglecting the country’s defence needs even for a moment is detrimental to the present as well as future of the country. The new agreements relating to defence sector signed last year, purchase of new defence equipment and indigenous production within the country under the Make in India initiative have all helped in boosting the morale of the defence forces and increasing the country’s military self-reliance. After a gap of many decades, the Indian Air Force is preparing to welcome, in the coming months, its new generation ultra-modern fighter aircraft Rafale and strengthen its strike capability. On this occasion, I would also like to congratulate the country’s security forces that are constantly striving to strengthen the country’s internal security. Their concerted efforts have played a crucial role in reducing terrorism and violence. In the last few years, a record number of youngsters in the Maoist areas have come forward to join the mainstream. The Police Memorial, which was dedicated to the nation last year seeks to honour their sacrifice and also preserves the memories of their sacrifice for the future generations. My Government is committed to the equitable development of Jammu, Ladakh and Kashmir. As a result of the efforts of my Government, an environment favourable to development has been created in the State. Recently, in Jammu and Kashmir, elections to Urban Local Bodies after an interval of 13 years and in Panchayats after 7 years have been conducted peacefully with more than 70 per cent voters participating enthusiastically. Committed to the development of Jammu and Kashmir, my Government announced a package of Rs.80 thousand crores. Under the package, projects related to infrastructure, health and education sectors worth more than Rs.66 thousand crores have been approved so far. It is a measure of my Government’s diplomatic success that today India’s voice is heard with respect at international fora. Pravasi Bharatiya Diwas organized recently in Varanasi has reinforced this fact. At the initiative of India, 21st June was declared as International Yoga Day by the United Nations and is now being celebrated with great enthusiasm across the world. Yoga is rapidly gaining in popularity at the global level. India is proud to have gifted the outstanding discipline of Yoga to the world community. My Government has not only enhanced the credibility and prestige of the passports held by the Indian diaspora but has also stood by them in their hour of need. During the last four years, more than 2 Lakh 26 thousand Indians stranded abroad have been rescued and brought back to the country. The United Nations Award for India’s efforts in the field of environment conservation has made every Indian proud. It is a matter of pride for all of us that India is providing leadership to the global solar revolution and last year the first summit of the International Solar Alliance was successfully organized in Delhi. This year our nation will provide a decisive impetus to our march towards a powerful, self-reliant and prosperous 21st century new India. The biggest festival of democracy will be celebrated this year in the form of General Election. Through this august House, I convey my best wishes to the young voters who will cast their votes for first time in this century. As citizens of India, they will exercise their right to vote, and determine the direction of the nation’s policies and decisions. My Government’s efforts are ushering in change for the betterment of the country and this process will continue. With the blessings and support of 130 crore Indians, my Government has commenced its journey towards building a New India. Let us all come together to pave the way for a New India and take India to glorious new heights in the 21st Century.